this is what peak performance looks like. The Dragon's Secret is a Swords & Wizardry Complete adventure for a party of 6-8 5th to 7th level adventurers. It's one of the biggest surprises of the year, for it is the first module released by industry veteran Jennell Jaquays in three decades. She worked as a game designer and artist of tabletop role-playing games and video games - including names like Dark Tower, Caverns of Thracia, Griffin Mountain, Age of Empires, Quake III. She wrote some of the finest dungeons the hobby has ever seen. What made them so great? Complex non-linear maps, vertical level design, interesting factions, and an attention to details, among others. The Alexandrian blog has a series of articles about the nuts and bolts of jaquayian dungeon design, which I consider a must read for every aspiring Dungeon Master. The Dragon's Secret is not an entirely new product. 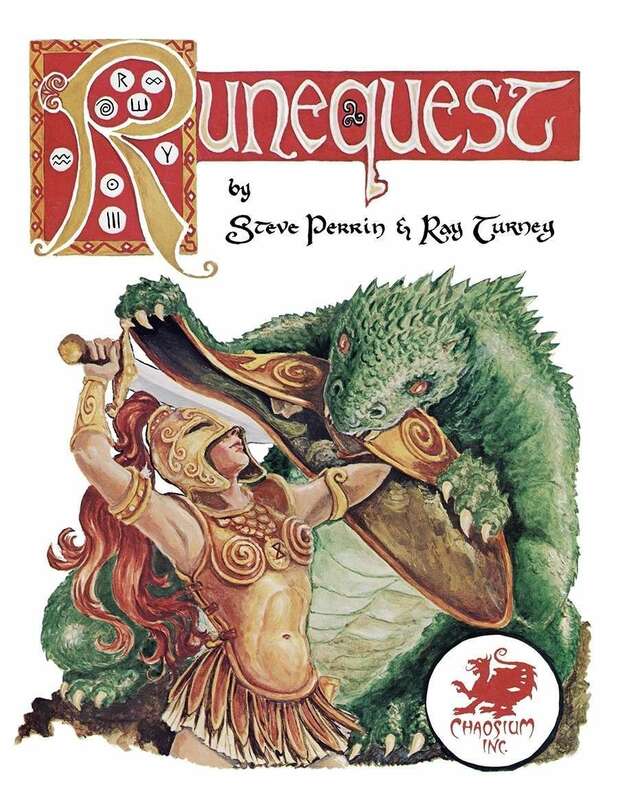 It's based on salvaged dungeon maps from the seventies, and an abridged version was already published last year as part of the North Texas RPG Con fundraiser (Legends of Adventure, by Pacesetter Games & Simulations). 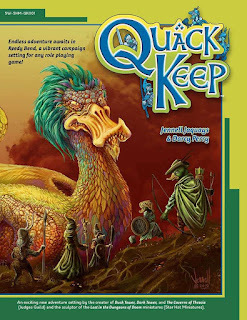 The revamped version was originally part of the Dungeons of Doom IV Kickstarter campaign by Star Hat Miniatures, along with its sister product Quack Keep. After all the limited editions it's no wonder I got giddy with excitement when I saw it finally being released on DriveThruRPG. I was also a bit worried though. Does Jennell still has her edge after three decades? 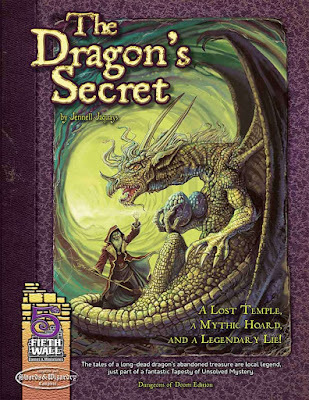 The Dragon's Secret is a 52 pages long book. The cover is the most drool-inducing I saw recently. I have a soft spot for ugly dragons, dragons with beaks, dragons with ears, dragons with hair, and Jennell's artwork hits the mark in every way. If the art wasn't enough in selling the module, there are still blurbs, taglines, summaries to help you make up your mind. They have all the right words that make my D&D-senses tingling: dungeon, doom, dragon, mystery, hoard, treasure! I usually don't linger much on covers, but this is so well laid out, written, and illustrated, that I had to stay and praise it a bit more than I planned. Time to move on! The interior has a nice two-column layout, and great black and white art done by Jaquays, Darcy Perry, Rick Hershey. My favorites are the medieval etchings, and the cartography, which is easily on Dyson Logos level. After the foreword we get a half page long backstory about how the Cathedral of the Golden Dragon has risen, and fallen. The whole institute started out as a scam: the gold dragon Aulde Dawne in reality was the sorceress Dawne Rozyfingers, polymorphed by her partner in crime Steed Bramble, who convinved the locals that keeping a gold dragon nearby at the cost of some golds and jewels would be beneficial. Fast forward an unknown amount of time, and you have a whole cathedral with acolytes worshipping the dragon. Bramble thought this would be the right time to get out, but died before he could finish the preparations. When Aulde Dawne learned the man who can polymorph her back to human form died she lost her marbles and devastated the countryside. Some heroes eventually hunted her down, but found little treasure in her lair. The next four pages are about using the adventure. I found most of it unnecessary, especially the explanation of how room and NPC descriptions are divided, because it felt self-explanatory: each segment starts with a keyword, so even the long-winded texts are easy to browse. The section ends with hooks, that for some unknown reason are split, and continued at the end of the book. That irks me probably more than it should. Fortunately it's worth flipping a bit back and forth, because the hooks are great! They are many and varied, which already shows that there is a lot to do! Highlighting the involved locations and NPCs at the end of each hook is a nice touch. The only way I think it could have been better is including page numbers, or links in the pdf. The adventure itself is divided into four major areas containing 34 rooms in all. It starts small with the The Cathedral of the Dragon and Connections, then once the players got their feet wet they characters reach Circular Illogic, which is bigger and more complex than the other three areas together. The final part, The Dragon's Horde, is just one large room - I'm sure you all know what that means... Reachig The Dragon's Horde will require a good deal of exploration. Opening the door requires finding the puzzle, its solution, and the two objects needed for it (optionally,ignoring the red herring). This won't be a linear romp from beginning to end. There are loops, branches, secret doors, illusion walls, and multiple connections between the levels - some of which can be discovered later. Vertical design isn't only used to connect the levels: several rooms are three dimensional, and get cross sections to make their layout clear. Speaking of rooms, there are some fantastic ones among them! Even the mundane entries get something to spice them up, be it some obstacle, an interesting detail, or a hidden treasure. Then there are those which your players will talk about years later. A spherical room with gravity on its surfaces and a gem at the top, that when removed can disable the elevator to the surface, probably also angering the 39 kobolds with paralyzing sticks living nearby. A huge hangar containing a 30 feet tall clockwork automaton, operated from a hidden control room occupied by two wanted mages. A well guarded false treasury jam-packed with fake objects and massive zombie spiders. A deathtrap with illusion chests, phantasmal floor, and crushing phantasmal walls at its bottom. A good dungeon needs memorable inhabitants too, and this is where Jennell kicks the ball out of the park. There are several factions and NPCs around the cathedral that can serve as valuable help, or annoying nuisance. Two apprentices who murdered their master are hiding down below. The senior was actually a member of the cult long ago, and hired two werewolf families to keep the place safe while he is away. A gurgle of gargoyles was cursed to guard Aulde Dawn's most valuable treasure. A group of fowl folk adventurers (mostly ducks) and a jerk aardvark are also looking for the dragon's riches, and aren't too fond of each other. The most prominent NPCs have a whole page devoted to them with illustration, background, rumors, and personality. They have fun quirks and traits, which is what turns them from stat block with some background info into fantastic personalities. For example the werewolf leader Elder Worgg doesn't want to transform because it will ruin his clothes. Glyphic Three-Horn the gargoyle leader who wants to throw off the curse of her kin thinks she was a human before becoming a gargoyle. That sounds like an adventure hook right there! It's also noteworthy that the dungeon's denizens aren't just standing idly stuck in a room, frozen in time, but are on the move. They are parts of the random encounter tables, there are guides how they react to various crises, and the gargoyles even have specific routes that helps them navigate through the dungeon easier. The book ends with supplemental content. There is a random curio table, which you can roll on whenever the room description says there is one. The table is filled with colorful items, and their value is a random roll on another table, so the results can be interesting, even downrigh ridiculous. The players might find a worthless jade flute, or an extremely valuable magical graffiti on the wall - it will be a joy to see how they will tansport that to the surface! We also get Swords & Wizardry stats for two new races: the fowl folk (ducks, geese, swans, and crows) and aardvarks. They get their own monster entries too, along with zombie spiders, living statues, and the horrible drakghuls, who are the children of Aulde Dawn and some other dragon (maybe? ), that were born undead and are calling ghouls to the area with their song. Yes, surprisingly The Dragon's Horde was not a typo. Surprisingly... The book captures the old-school Judges Guild feel in its editing too. It's full of typos, missing whitespaces, double or missing articles, gibberish sentences, and even Aulde Dawne is refered to as a brass dragon instead of gold somewhere. The room entries have some redundant information too. Another readthrough by someone, or hiring an editor would have helped a lot. Looking past these annoyances I found the writing style amusing, with a good amount of humor and wordplay thrown in. In the end, it seems my fears were irrational. While The Dragon's Secret has some warts, it is a splendid adventure. It's fun, it's colorful, it's dynamic. It's not Dark Tower or Caverns of Thracia, but it is on par with a good module right out of Dungeoneer magazine. Jennell said this is but a fragment of her Thousand Worlds campaign setting, and more is coming soon. Well color me interested, I definitely want more of this! 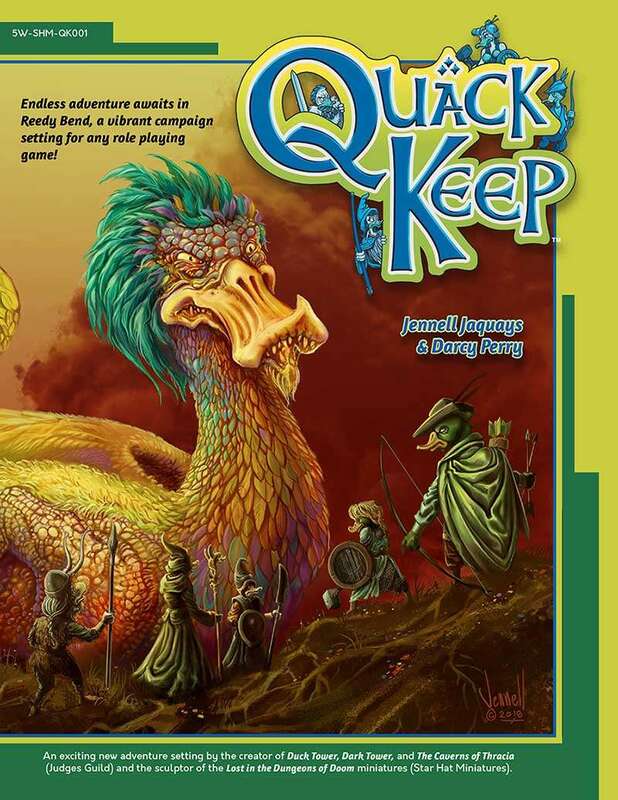 In the meantime, I will bang my head into my desk, because I didn't buy Quack Keep before it was taken down from DriveThruRPG for revision. Tl;dr: Even with the bad editing The Dragon's Secret is a fun read, and a good example of how to design a complex and living dungeon. You can buy it HERE. Disclaimer: The DriveThruRPG links on this site are affiliate links. If you buy something through the link we'll get some credit for your purchase too. A monster that makes you quack with fear. Frog God Games storms Indiegogo with their The City that Dripped Blood campaign, which isn't a brick-sized tome you can beat players to death with (if character death wasn't satisfying enough), but an approximately 24 pages long adventure. I like small modules and the premise reminds me of R. E. Howard's Red Nails (one of my all-time favorite sword & sorcery stories), so I ended up supporting the Cult of Tsathoggua with $6. Jennell Jaquays hasn't released any rpg-related products in the last thirty years, until now. It seems she gathered enough strength to return with not one, but two adventures - and there are more coming! The Dragon's Secret and Quack Keep were all parts of various Star Hat Miniatures kickstarters, and are now available on DriveThruRPG. I'm almost done with The Dragon's Secret, so expect a review coming soon. As for Quack Keep, my Wisdom checks were successful so far, but rest assured I'm going to fail next month. While I'm struggling with my last ZWEIHÄNDER session reports and getting the next session going (it's summer after all), the game is growing strong and is about to reach new heights with its MAIN GAUCHE supplement. The content is ridiculously tempting, but I have to moderate my expenses and be satisfied with the pdf version, for now. Daniel, if you're reading this: please call the next supplement BOHEMIAN EARSPOON. I know there are people out there who want to see that title on the shelf. Oh, and before I forget: Echoes of Fomalhaut #2 is out too. A humble fan of classic fantasy literature and old-school rpgs - both the tabletop and digital kind. Hét éve Kockák és Koboldok!